Casement windows have long been a favorite among homeowners. They are beautiful windows that can truly transform the look of a home. Casement windows are hinged on one side and open outward to offer excellent ventilation and their slimmer frame profile maximizes natural light. When closed, they offer unimpeded views using the entire window. 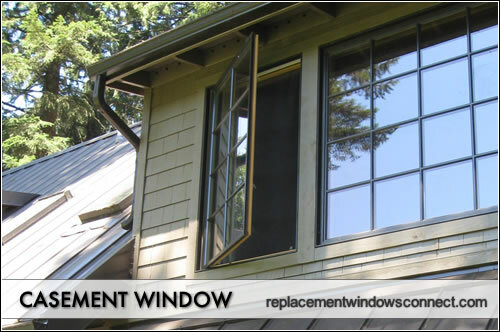 As far as operable windows, buying these replacement windows will offer the best compression seals to maximize a home’s energy efficiency. Casement windows are a traditional and classy window. They’ve been around forever with a look that is familiar and comforting, but can also be elegant and sophisticated. Casements are chameleons, blending with a variety of architectural styles. They can enhance the look of a home, giving it a welcoming, elegant appeal. Casement windows also seal better, resulting in less air leakage. This also has to do with the fact that they are hinged on only one side. This allows for the use of highly effective compression seals on four sides as opposed to two; as would be the case with gliding or double-hung windows. Casement windows are also very simple and easy to clean. They allow easy access to the whole pane, instead of halves of window with a hard-to-reach middle part obscured by framing mechanisms. For truly low-maintenance, vinyl windows are an excellent option. Vinyl frames offer a wide variety of colors, and are very resistant to damage from the elements, including wind. With today’s vinyl frames, the color is consistent throughout the frame and won’t fade or require repainting as do wood frames. As with any modern window, they can be customized to meet your unique needs for style, color, and performance. Multiple glazings, low-E coatings, gas fills, and the appropriate U-values can be combined with the color and finish of your choice and a remarkable variety of window hardware. The locks and handles, and type of grid finish, if you opt for it, can all help create a beautiful and sophisticated window that will give your home a graceful, more elegant look. Find out more on Casements are in the middle of the price spectrum. The following pricing is for standard sized windows that don’t involve overcomplicated installation costs. Casement windows are an excellent choice for any room of the house, from kitchens to bedrooms to dens. However, if the window looks out onto a pathway or well-trafficked area, they might not be the best option. Casement windows open outward and could create a physical hazard if they conflict with foot traffic. You’ll also want to take care with adjacent windows. Casement windows that are next to one another might come into contact when opened; depending on their angles. Remember that they open outward from one hinged side. Lastly, one maintenance issue that could arise is that the cranking (or slider bar) mechanism can fail over time due to extended wear-and-tear. Replacing a crank can cost anywhere from $25 to over $100, but the bigger difficulty often lies in finding the same color and finish as before. This is one reason that many consumers opt for more well established replacement window manufacturers that stock and carry more hardware options.